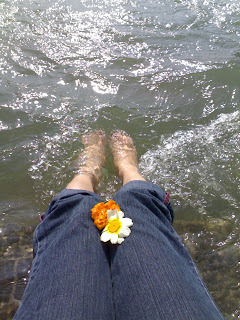 Flight of a little bird: Rishikesh and Shivpuri this time! 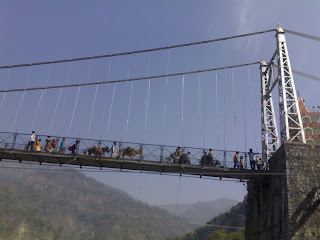 Rishikesh and Shivpuri this time! It started with a phone call on Friday afternoon from Anirban. "Do we have any important task to be completed this weekend".. ..... "nothing very important, usual household stuff to be done" I answered. 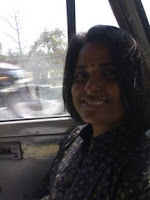 "So here's the plan for the weekend - we are leaving for Rishikesh and Shivpuri Friday evening. I want you to come little early so that we can start on time" he added. It was Thomas's farewell on Friday and I did not want to miss that. So no way I could leave early, But I managed to take the first cab, told the driver to make it fast, taking risk but better than angry husband. I managed to reach by 7.15pm. 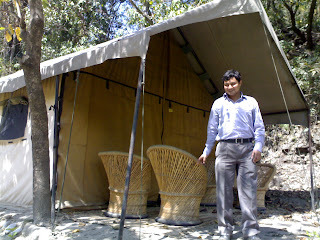 Anirban with his friends, Agni and Pratigyan, was waiting for me all packed up. 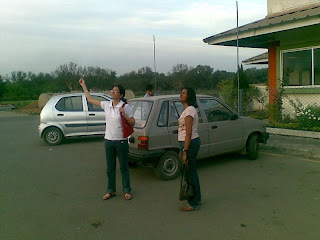 We were going by Agni's car, an antique piece. He had been busy getting car serviced the whole morning. I hope we reach back safe and sound. Oh ya we did and that's why I am writing this blog. Agni, please don't underestimate your pyari Maruti. Agni - A business man, has a super sense of Humor, down to earth person and fun to be with. 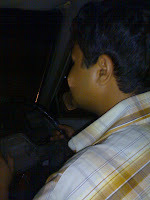 Pratigyan - TOI journalist, who is a good friend and agreed to come for a trip after so long. May be her first and the last trip with us. Not because she does not want to come with us but because she is too busy for a trip. Just FYI Pritigyan and Agni do not know each other. 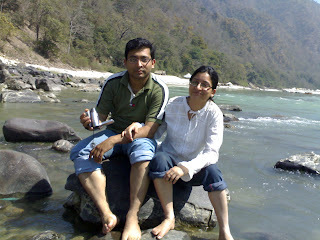 We decided to stay at Haridwar the Friday night, so that we can go visit Haridwar early morning. But the main reason behind was - it is easier to get Hotels at night, actually late mid night, in Haridwar than in Rishikesh. Took 2 rooms one for Guys other for Gals. We girls decided to get up early in the morning and go to the ghat and enjoy Aarti. We put the alarm on for 5.00am and went to sleep at around 1.00AM. Though we could not make it to the aarti but could hear the bells ringing at distance. 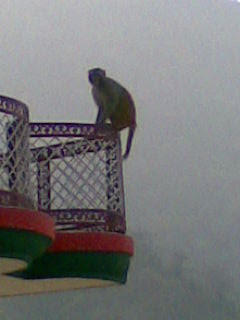 Everyone got up at around 8.00, had chhole puri and roamed around at the Ghat. I liked it in the morning. After saying welcome hello to Ganga ji we started for Shivpuri at around 11.00am. Though it was too hot with bright sun above our heads, it could not stop us from enjoying. Had to go down the hill, would we call it a hill, may be, well... a small one, the guys were worried about us girls....and look at them now...we are already down and they are still struggling. Hehehe...Girls are always first u c.
We did bird watching and rafting... It was great fun. 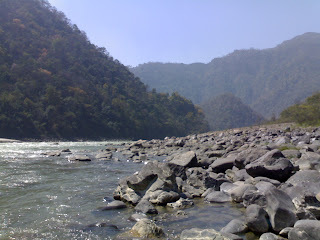 Spent the day there and came back to Rishikesh late evening. Agni helped us find a Hotel. Probably the one he stayed at when he came the last time. It was very nice. Clean, perfect location and very nominal. The only thing we didn't like about it was that it does not have a restaurant and one has to go out to take meals. So after relaxing for a while we went out for Dinner. Aaloo gobhi, Dal fry and garama garam tadoor ki roti. For me it is heaven, but for others ...hahaha...what to say, they all kept complaining about the food. No non veg stuff available. The night was cool. Sound of flowing water, bells ringing at distance, some recorded chants playing somewhere near by...divine feeling :) Apparently, the ambiance is the reason why we have so many foreigners around. More than locals or Indian tourists we had foreigners here. Dressed in Indian attire and trying to speak Hindi, they seem to be more cultured, Indian cultured, than most of "us". They would take pride saying "Namaste" instead of hello and "Dhanyawaad" in place of Thank you. 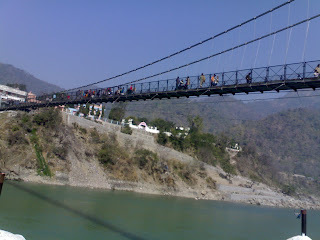 Visited Rishikesh the whole morning. 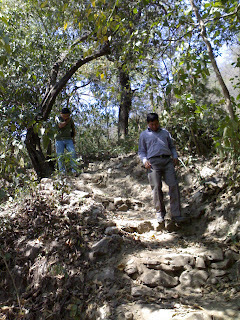 Laxman jhoola, Ram jhoola, fed fish.... and started our back journey at around 12.00pm. Had lunch at Haridwar. Looking forward to more such trips. Hey those of you who are thinking how did we manage that, will have to come with us on the next trip. u write like magic, i feel i am also travelling, nice pics,gorgeous description!! Bhabhie the way you have represented the whole thing is really wonderful.But you have missed the river rafting and trekking part.The way you are writing you will give the editors of leading dailies a run for their job.